GoodReads Summary: Enter a world where everything, even our classic fairy tales, is not at all what it seems. What Jen Thinks: I love the spunky attitudes of these four princes. I remember reading Once Upon a Marigold and it's sequel and being so happy that the books acknowledged that "happily ever after" comes with some hiccups. Happily ever after sounds wonderful, but there are ups and downs in any marriage - especially when you throw kids into the mix. Anyway...the princes in this story find themselves in the not so ideal part of their happily ever afters. I love how Healy brings all of these characters to life. They are each so unique but at the same time so full of personality. I found myself laughing at the exchanges between the princes and in how they went about their adventure. The dialogue is great in this story. It really helps readers get an understanding of who each character is. I love the relationships that the princes develop with each other. This is a perfect mentor text for looking at characters and dialogue but also at how relationships can drive the plot. I dare you to read this and not laugh at the antics these princes get themselves into and out of while trying to save their kindgoms. What Kellee Thinks: I LOVE retellings of fairy tales and this one is no exception. And what is even better about this one is it is HILARIOUS! It reminds me a bit of Shrek except I liked the humor in Hero's Guide better because I feel it is a very smart funny. 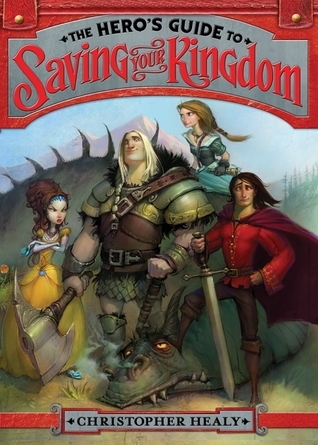 Just the concept is funny and smart- the four Princes Charming from the Snow White, Cinderella, Rapunzel and Sleeping Beauty stories star in this book (unlike the original stories where they don't even get credit with their real name!) and the Princes each have such a fun, unique personality. While reading this, the teacher in me found many different parts that I could use- specifically when talking about point of views. I already use The True Story of the Three Little Pigs and the movie "Hoodwinked" to discuss it and Hero's Guide will be a perfect addition. I even found a part that made grammar funny!! And there is foreshadowing, a perfect plot arc, and suspense. “Prince Charming is afraid of old ladies. Didn’t know that, did you? Don’t worry. There’s a lot you don’t know about Prince Charming: Prince Charming has no idea how to use a sword; Prince Charming has no patience for dwarfs; Prince Charming has an irrational hatred of capes. Some of you may not even realize that there’s more than one Prince Charming. And that non of them are actually named Charming. No one is. Charming isn’t a name; it’s an adjective. ‘You complained when I wiped the gooseberries off your face,’ Frederic said. ‘That was an invasion of my personal space,’ Gustav retorted. Frederic and Duncan continued to jabber on excitedly about Sir Bertram. Neither of them had ever met another person who shared his wild enthusiasm for the dandy adventurer. The chapter titles are hysterical: “Prince Charming Defends Some Vegetables”, “Prince Charming Has No Idea What’s Going On”, “Prince Charming Should Not Be Left Unsupervised”. Writing Prompts: You have to really know your character in order to write about that character. On a blank sheet of paper, draw and label everything you would find in your character's closet. Make a list of common phrases your character would say. Do this for another character and then write a scene where your two characters have a discussion.